Current methods for measuring long-term endogenous production of cortisol can be challenging due to the need to take multiple urine, saliva or serum samples. The stress hormone cortisol is slowly incorporated into the growing hair shaft of humans, nonhuman primates, and other mammals. 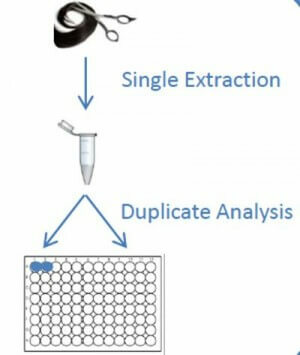 We have developed and validated a method for Cortisol extraction and analysis. In contrast to Cortisol obtained from plasma or saliva, hair Cortisol provides an integrated measure of hypothalamic-pituitary-adrenocortical (HPA) system activity, and thus physiological stress, during the period of hormone incorporation. Because human scalp hair grows at an average rate of 1 cm/month, CORT levels obtained from hair segments several cm in length can potentially serve as a biomarker of stress experienced over a number of months. Extensive research over the last few years in the laboratory have led to the development of a reliable extraction and analysis technique which can be used to measure hair cortisol concentrations in human and animal hair retrospectively. Our hair cortisol collection booklet explains the hair collection in a few, easy to follow steps. Once the samples are received, cortisol is extracted from hair with a methanol extraction method and subsequently the extracts are analysed with our highly sensitive salivary cortisol assay.